The Password field is great for entering passwords or other private information. Entered characters are displayed as dots so it is not readable. The entered text is normally saved as plain text (not hashed) in the database. If you use the Registration Add-on and map the password field to the WordPress password, the password will not be saved in Formidable. Would you like to translate the specific error messages such as 'Passwords require at least 8 characters'? Learn more about how to translate strings in Formidable Pro. Check the box to 'Show password strength meter' to show a password requirement list under the password field. As the user types, each red X in the password indicator will turn to a green checkmark as the requirement is filled. When the option to 'Require a strong password' is not checked, the strength meter is a guideline and is not enforced with validation. 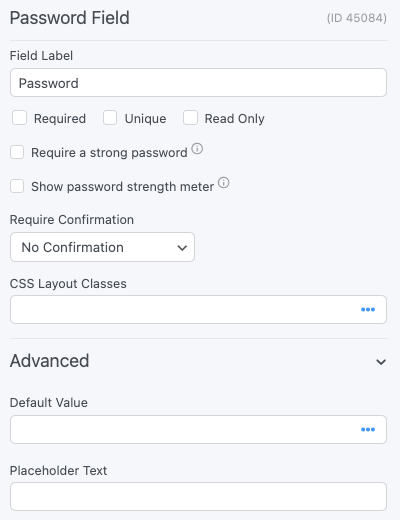 The default value icons can be used to specify whether the text entered in a Password field on the form builder page should be a default value or a placeholder. Learn more about how to set a placeholder in a Password field. Display the value submitted in a Password field in a form's confirmation message, email, or View. Just insert [x], where x is the ID or key of the Password field. If you are mapping a Password field to the password option in a Register User action, you will not be able to display the password value. A user's WordPress password is not saved in Formidable database tables. Require a minimum number of characters with the frm_validate_field_entry hook. Add extra password validation to check the strength. Set the minimum length, and require at least one number and one letter with the frm_validate_field_entry example.